Taichara recently posted a collection of tables for random potion characteristics. I really enjoyed them, so I created a modified set for my campaign and added an extra table for potential side effects. You can find the results as a one page PDF that can be printed out conveniently for a gaming binder. These tables are valuable because they allow me to add a lot of detail to a campaign world with minimal effort. I don’t have to go through the rules and annotate the magic item entries potion by potion. With a set of tables like this, the first time PCs find, for example, a potion of heroism, you can roll up a description and from then on that’s what a potion of heroism looks like. You can describe it in the future and perceptive players will know what it is. Rolling on eight tables in the middle of play can be cumbersome, so I would recommend rolling up some sample potions beforehand and adding them to another single table, which would be the one you actually roll on during play. This kind of procedure could be used generally for any domain which might need to be detailed on the fly. Some examples: spell components, NPC personalities, shops present in a village. Such tables are like unbound precompiled details. Nobody, not even the referee, knows what a potion of levitation looks like before one is discovered. I think that’s a good thing. It helps keep the setting fresh, and can lead to (but does not require) interesting referee improvisation. A while back, I discussed the difference between random tables used for preparation and random table used on the fly. The nature of this set of potion tables seems to lie somewhere between prep tables and play tables. It’s the unbound nature of the descriptions that are important, because beforehand you know you might need to describe a potion, but you don’t necessarily know which potions might need descriptions. This is another method to allow players to engage with and learn about your campaign setting (and to make your setting richer in the process). Further, all this detail can be campaign-specific, so that every game is a unique process of discovery. This entry was posted in Uncategorized and tagged technique on March 8, 2012 by Necropraxis. This is a good idea, all my potions colors have been imprinted on me from the infinity engine. Healing is blue, poison is green, grey is invisibility, etc. Determining it on the fly and staying consistent is always a good thing and keeps things from becoming stale for longtime players. I do like the idea of having a universal standard among alchemists because of all the mishaps that could happen if you had multiple competing standards. However, a part of me will always have a secret roll to see whether this potion came from a hermetic potion brewer or perhaps from another age where these standards were not so strictly defined. So that a potion that fits the characteristics of those other potions of healing they found may end up being something much more disastrous. Nothing like a potion of giant’s size in a cramped barricaded room to get the player’s blood pumping. One could also build up a table of mixtures: one potion of heroism plus one potion of giant strength = a potion of superheroism. I like the idea though, perhaps a potion of speed and a potion of healing bestows regeneration. Although my inner killer DM thinks that this would be an entertaining way for PC’s to unwittingly sabotage themselves. A table listing awful side effects of potion mixing would be a worthy endeavor. I walk in your footsteps toward the essential things to be gotten from tabletop RPGs. One of the happy goose-chases you’ve sent me on with this post today is a constellation of posts lauding something I call “emergent story.” I don’t know whether I am using that term in the same way other people are using it. What this means is, you put the world, the heroes, the rules, and the dice into a box; you crank the handle; some stuff happens for a few hours. Afterwards, you and the other players make sense of it all. The story emerges. It is not written ahead of time. It is there to be found; you all find it together. This is one of the qualities of deep and essential importance of the tabletop RPG. That’s a very nice thing to say, but really I’m just learning most of this stuff from other folks and trying to make sense of it to myself by writing about it. I imagine there are probably lots of different things that various people can get out of RPGs, but that sense of finding as a group the story that emerges is certainly one of the most interesting aspects to me. 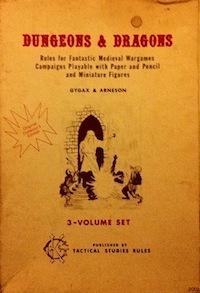 It might even be unique to RPGs as a medium. Baker’s Apocalypse World “play to find out what happens” is also a good encapsulation, I think, of the basic idea. I chose my words carefully: I’m following in your foot steps. This wasn’t planned. It is coincidental. There’s a space of about three years from when you started your journey to when I started mine. But it’s the same journey. I read about ten OSR-related blogs daily and I participate on two fora. So I’ve been consuming a lot of stuff too and synthesizing it in my head. I don’t think the world needs another blog. There are already so many great examples of the infotainment form. This one you write is very, very good. Last weekend I went through all your posts from the beginning until mid-2012. You were then discovering things that I have been discovering now, roughly in the order I have been discovering them, and making sense of them in the same way I have been. This blog is invaluable to me secondarily as a how-to guide, but primarily as an anthropological record. Well, 1 and 1A. That’s why I say I am following in your footsteps. Your site here is clearly marking out the trail that I have found myself walking. Will it forever be so? I don’t know. Maybe some day I’ll have to take serious issue with your opinions. If it ever so happens, remember that you have done much of the intellectual heavy lifting in the field of OSR anthropology that makes it something people want to argue about. But I don’t think it will.